Not to be confused with her niece Kathleen Kennedy Townsend. For other people named Kathleen Kennedy, see Kathleen Kennedy (disambiguation). Kathleen Agnes Cavendish, Marchioness of Hartington (née Kennedy; February 20, 1920 – May 13, 1948), also known as "Kick" Kennedy, was an American socialite. She was the daughter of Joseph P. Kennedy, Sr. and Rose Kennedy, sister of future U.S. President John F. Kennedy, and wife of the Marquess of Hartington, heir apparent to the 10th Duke of Devonshire. When her father was serving as United States Ambassador to the United Kingdom, Kathleen made many friends in London and was the "debutante of 1938." 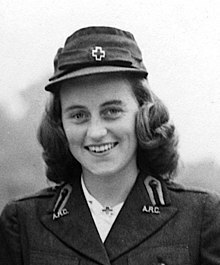 Working with the Red Cross, she began a romantic relationship with Lord Hartington, whom she married in May 1944. He was killed on active service in Belgium only four months later. Kick died in a plane crash in 1948, flying to the south of France while on vacation with her married partner, the 8th Earl Fitzwilliam. Kathleen Agnes Kennedy was born in Brookline, Massachusetts, the fourth child and second daughter of Joseph P. Kennedy, Sr. and Rose Kennedy. She was nicknamed "Kick" because of her "irrepressible nature." Kathleen was especially close to her older brother, John F. Kennedy, known as "Jack." Kathleen was educated at Riverdale Country School in the Riverdale section of the Bronx, New York City. She also attended Noroton Convent of the Sacred Heart in Noroton, Connecticut and the Holy Child Convent in Neuilly, France. While the Kennedy daughters were not raised to have political ambitions like their brothers, they were nonetheless provided with many of the same educational and social opportunities owing to their father's powerful financial and political connections and influence. This was particularly the case when President Franklin D. Roosevelt appointed Joseph as United States Ambassador to the United Kingdom in 1938. As a child, Kathleen was very athletic and played football with her brothers. Her optimism and high spirits attracted many suitors, some of whom were Jack's closest friends. When Kathleen attended the Riverdale Country School, her mother did not approve of the male attention she attracted and sent her to the all-girls Noroton Convent of the Sacred Heart. Eventually, Kathleen started to date and had her first serious relationship with Peter Grace, an heir to W. R. Grace and Company. Kick's time in England during her father's term as Ambassador would dramatically influence the remainder of her life. While living in England, she was educated in London at Queen's College and quickly cultivated a wide circle of friends, both male and female, in British high society. She dated David Rockefeller and was declared the "debutante of 1938" by the English media. Following the German invasion of Poland and the outbreak of World War II in September 1939, the entire Kennedy family, save for Joseph and daughter Rosemary, returned to the United States. Kathleen, having become very fond of England and the many friends she had made during her two years there, petitioned her parents to remain in London in spite of the coming danger. However, she was overruled by her father and sailed back home in the early fall of 1939. After returning to the U.S., Kennedy enrolled at the Finch School for a time and then attended Florida Commercial College. In addition to her studies, she also began doing volunteer work for the American Red Cross. In 1941, she decided to leave school and began working as a research assistant for Frank Waldrop, the executive editor for the Washington Times-Herald. She later teamed with Inga Arvad, who wrote the "Did You Happen to See....." column and was eventually given her own column where she reviewed films and plays. In 1943, seeking a way to return to England, Kathleen signed up to work in a center for servicemen set up by the Red Cross. During her time in England, both before and particularly during the war, she gradually but increasingly grew more independent from her family and the Roman Catholic Church they belonged to. During this time, Kick began a romantic relationship with politician William Cavendish, Marquess of Hartington (usually known to his family and friends as Billy Hartington). He was the eldest son and heir apparent of the 10th Duke of Devonshire. The two had met and begun a friendship when she moved to England when her father was appointed American Ambassador. Despite objections from her mother, Kennedy and Lord Hartington reunited upon her return to England. Rose especially rejected their relationship because she saw that their marriage would break the laws of the Roman Catholic Church by allowing Kathleen's children to be raised in the Church of England (Anglican Communion) rather than the Roman Catholic Church. Rose even tried to manipulate their relationship by keeping Kathleen away from Hartington and postponing a possible wedding. Regardless, Kathleen stubbornly married Hartington on May 6, 1944, in a civil ceremony at the Caxton Hall Registry Office. Kick's eldest brother Joseph P. Kennedy, Jr., an officer in the United States Navy, to whom she had grown close during the last year of his life as he was serving in Britain in the United States Army Air Forces during the war, was the only member of the family to attend the ceremony. Her second eldest brother, Jack, was still hospitalized due to a back injury incurred on the motor torpedo patrol boat PT-109 in the South Pacific Ocean, while her younger brother, Robert F. Kennedy, was in naval training. On August 12, 1944, Joe Jr. was killed when his plane exploded over the English Channel during a top-secret bombing mission in Europe. He had been flying a B-24 bomber equipped with rudimentary "remote flying" technology and packed with explosives destined for the Fortress of Mimoyecques. The plan was for Joe Jr. and his co-pilot to bail out once the controls had been taken over by a second plane flying at 20,000 feet, but an electrical fault caused the "flying bomb" to explode before this could happen. Kathleen, now Marchioness of Hartington, and Lord Hartington spent less than five weeks together before he went out to fight in France. Four months after their marriage, and less than a month after Joe Jr. was killed, Hartington was killed by a sniper during a battle with the Germans in Belgium. With his family's blessing, he was buried close to where he fell. His younger brother Lord Andrew Cavendish, who was married to Debo Mitford of the famous Mitford sisters, thus became the heir apparent to the dukedom as Billy Hartington had left no heirs. Popular on the London social circuit and admired by many for her high spirits and wit, Lady Hartington eventually became romantically involved with the 8th Earl Fitzwilliam, who was in the process of divorcing his wife. Once again, Rose Kennedy expressed her disapproval of her daughter's suitor and warned Kick that she would be disowned and cut off financially if she married Lord Fitzwilliam. In May 1948, Kathleen learned that her father would be traveling to Paris. In an effort to gain his consent for her upcoming plans to marry Fitzwilliam, she decided to fly to Paris to meet with her father. St Peter's Churchyard, Edensor - grave of Kathleen Cavendish, Marchioness of Hartington (née Kennedy, 1920–1948). Her grave is marked with a headstone and a plaque in the ground commemorating the visit of 35th U.S. President John F. Kennedy at the gravesite. On her gravestone, it says "Joy she gave joy she has found"
On May 13, 1948, Lady Hartington and Lord Fitzwilliam were flying from Paris to the French Riviera for a vacation. aboard a de Havilland DH.104 Dove. At 3:30 in the afternoon, their plane took off, reaching an altitude of 10,000 feet (3,000 m). Approximately one hour into the flight, radio contact was lost with the plane when it entered the region near Vienne which was also close to the center of a storm. The plane's four occupants endured twenty minutes of severe turbulence which bounced their small plane up and down as much as several thousand feet at a time. When they finally cleared the clouds, they instantly discovered the plane was in a dive and moments away from impact, and they attempted to pull up. The stress of the turbulence coupled with the sudden change of direction tore loose one of the wings, followed by both engines and finally the tail. The plane's fuselage then spun into the ground seconds later, coming to rest nose down in a ravine after striking terrain near the summit of Le Coran, the highest of the Cevennes Mountains in Saint-Bauzile, Ardèche, France. Lady Hartington was instantly killed along with Fitzwilliam, pilot Peter Townshend, and navigator Arthur Freeman. Her father was the only family member to attend the funeral, arranged by the Cavendishes. Rose Kennedy refused to attend her daughter's memorial service, instead, it was claimed, choosing to enter a hospital for routine medical tests. The Kennedy Debutante, a fictional novelization of Kennedy's life, was published by Berkley Books in 2018. Written by Kerri Maher, it was well received, including being named a "Best Book of the Week" by the New York Post. The gymnasium at Manhattanville College is named in Kathleen Kennedy's honor. Robert F. Kennedy named his eldest daughter in honor of his sister. ^ McAfee, Tierney; McNeil, Liz (April 13, 2016). "The Untold Story of Kathleen 'Kick' Kennedy, Who Defied Her Parents and Died in a Tragic Plane Crash with Her Married Lover". People. Retrieved September 13, 2016. ^ Heil, Emily (11 July 2016). "New Kick Kennedy bio recounts her father's affairs with Hollywood actresses". The Washington Post. Retrieved 13 September 2016. ^ a b "Kathleen Kennedy". jfklibrary.org. ^ Buck, Pearl S. (August 4, 1970). "Kathleen put love before religion". The Montreal Gazette. p. 15. ^ a b "Kathleen Kennedy Loses Husband in Action". The Pittsburgh Press. September 18, 1944. p. 2. ^ "Kathleen Kennedy Flies From London". The Lewiston Daily Sun. August 17, 1944. p. 1. ^ Bailey, C. (2007). Black Diamonds: The Rise and Fall of an English Dynasty, pp. 406–419. London: Penguin. ISBN 978-0-670-91542-2. ^ a b Hilty, James (2000). Robert Kennedy: Brother Protector. Temple University Press. p. 52. ISBN 1-439-90519-3. ^ Schenectady Gazette May 15, 1948. ^ "The Kennedy Debutante". Publishersweekly.com. Publishers Weekly. October 2018. Retrieved 2018-10-11. ^ Dawson, Mackenzie (2018-09-28). "The best books of the week". nypost.com. The New York Post. Retrieved 2018-10-11. ^ Rhule, Patty (2018-10-09). "JFK's spirited sis 'Kick' Kennedy grabs the spotlight in a new historical novel". USA Today. McClean, VA. Retrieved 2018-10-11. Leamer, Laurence. The Kennedy Women: The Saga of an American Family. New York: Villard Books, 1994. Print. "Kathleen Kennedy biography". John F. Kennedy Presidential Library and Museum. Secrets of The Manor House, first shown of Channel 4, later on Yesterday, Series 1, Episode 3. This page was last edited on 15 March 2019, at 04:08 (UTC).